Home Page | The Kentucky SHRM Council, Inc. The Kentucky SHRM Council, Inc., (KYSHRM) is the state affiliate of the Society for Human Resource Management (SHRM). SHRM is the world’s largest HR professional society, representing 300,000 members in more than 165 countries. For nearly seven decades, the Society has been the leading provider of resources serving the needs of HR professionals and advancing the practice of human resource management. SHRM has more than 575 affiliated chapters within the United States and subsidiary offices in China, India, and United Arab Emirates. KYSHRM serves over 3,000 human resource professionals and advances the HR profession in Kentucky through our local chapters, as well as our student chapters. 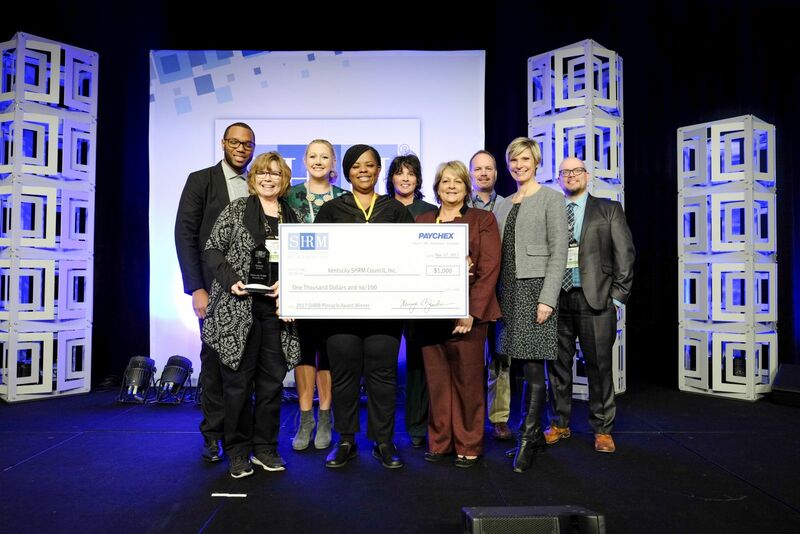 WASHINGTON, D.C. – The Society for Human Resource Management (SHRM) presented the Kentucky Chapter and 11 other affiliates with its Pinnacle Award — the highest honor given to SHRM state councils and chapters for notable contributions to the human resource profession. “This year’s Pinnacle Award winners have shown exceptional HR leadership through their innovative chapter and council programs,” said Henry G. (Hank) Jackson, president and CEO of SHRM. The Society for Human Resource Management (SHRM) is the world’s largest HR professional society, representing 285,000 members in more than 165 countries. The Pinnacle Award, created in 1991, is the most prestigious achievement SHRM state councils and chapters can attain. According to Kentucky SHRM Chair, Lynn Ingmire, major industries in Kentucky are expecting growth over the next 3-5 years, yet many say they are having difficulty recruiting qualified workers. “We created an initiative called Bridging the Talent Gap-Kentucky to bring together industry, governmental and education leaders to address this situation,” said Ingmire. The Kentucky Society for Human Resource Management (KYSHRM), surveyed over 1,000 businesses and found of those participating that 86% of manufacturing, 70% of health care, and 80% of professional, scientific and technical services companies expect growth over the next 3-5 years. However, 84% of the respondents say they are having difficulty filling positions. “Through statewide professional development workshops and the use of innovative new media, business and organizational leaders from across the Commonwealth actively engaged with the data collected to better understand the talent and education challenges they are confronting within their organizations,” said Ingmire. “Educators and government officials in the training sectors now have information as to the skill sets necessary for people to be successful in their jobs today and in the future,” she said. The Kentucky Chamber of Commerce, the Kentucky Community and Technical College System, and the Kentucky Cabinet for Education and Workforce, along with numerous private partners and employers are participating in Bridging the Talent Gap-Kentucky. PLEASE CLICK THE LINK BELOW TO REVIEW OUR DASHBOARD.